Coating's an unforgiving process, but a clear understanding of key parameters, and straight shooting, can help ensure success. Film coating is an unforgiving process. It demands consistent tablet hardness, as well as controlled spray rates, temperature and drying air flow rates. Although automation is improving, the process cannot be fully controlled by a computer. · Adhesion of particles to the gun surface. This article will concisely present those parameters, review a few of the nuts and bolts of film coating, and offer troubleshooting tips. 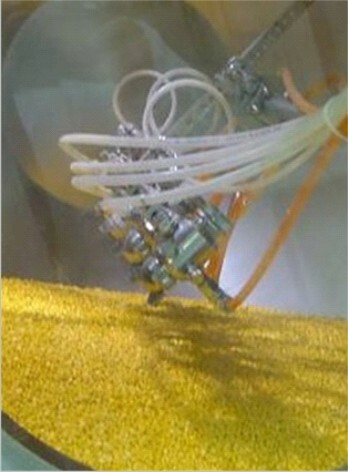 Placement of the spray gun (photo, below right) relative to the bed, and boom placement in particular, is very important, yet it is typically overlooked during scaleup or product transfer. The ideal placement will vary between equipment manufacturers and pan models. · Side to side will generally result in overwetting. · Up or down will cause solution to stick to the pans. The gun-to-bed distance is fixed, never a range, and the proper value is usually included in the product specification. Usually, for aqueous coatings, settings are 8 or 10 in. from the bed, depending on the spray rate used. However, the gun-to-gun distance, which is usually assumed to be fixed, may change during maintenance or gun change-out. Therefore, this dimension must be verified prior to each new coating campaign. This value isnï¿½t usually stated as a specification or set point on the worksheet, but the setting is typically 5.5 or 6.0 in. from gun tip to gun tip between guns. Good gun placement includes a fixed gun-to-bed distance and a consistent gun-to-gun setting. This setting is widely understood but not always recognized as a variable that should be checked. In order to optimize the distance between the gun and the side of the pan, the operator should measure the tip of the last gun on either side of the boom, either to the front side of the pan or to the back of the drum. If this distance is set incorrectly, there will be solution on the window, solution on the side of the pan, or on both the side and the back of the pan. The setting can be checked with placebo tablets or a large sheet of paper before the gun is fixed, and should be checked regularly thereafter. A flashlight helps in looking for problems. Tablet beds may differ based on pan charge, batch yields and the size and shape of the tablet. Guns should be set at the bottom of the waterfall in the upper third of the bed. This setting should be rechecked at the start of each campaign, or any time pan charge changes. Calibration is also critical. Variation in solution rates between guns is a common problem. This value should not vary by more than +/- 10 ml between guns. If the variation exceeds the recommended value, the needle stroke can be adjusted from the back of the gun. Pattern air shapes the suspension cone, so the more air, the flatter the cone. In some systems, pattern air is fixed and in others it is variable and set by the operator. Excessive pressure causes unusual defects in product that are usually wrongly attributed to other causes. This value should never be positive. Typically, it should be set between -0.1 in. and -0.50 in. (H2O). It should never exceed -1.0 in. H2O. Pressure can be seriously reduced when the seals used to maintain this pressure weaken or break. Any damaged seals should be replaced immediately. There is no single setting for this, although there are rules of thumb based on tablet size, shape and load (Pharmaceutical Manufacturing, October 2004, p. 43). Two basic pan speeds should be set for each product: an initial speed to achieve a basic covering, then a steady state speed to optimize the finished tablet appearance. Anti-slide bars and baffles can be used to center the tablet bed in front of the outlet air plenum. These are not used for mixing, and should be mandatory in any installation. Baffles, however, do serve as a mixing device, and are usually supplied as a standard feature regardless of the vendor one selects. This value should usually be set between 80 and 150 ml/min. for each gun. For installations where the gun-to-bed distance is 8 in., 80 ml/min. per gun would be the recommended level. For installations with a gun-to-bed distance of 10 in., the recommended distance would be 120 ml/min. per gun. Thus, monitoring outlet air temperature helps determine whether other factors may have changed or shifted. Total air volume, in ft.3/min., determines coating efficiency. 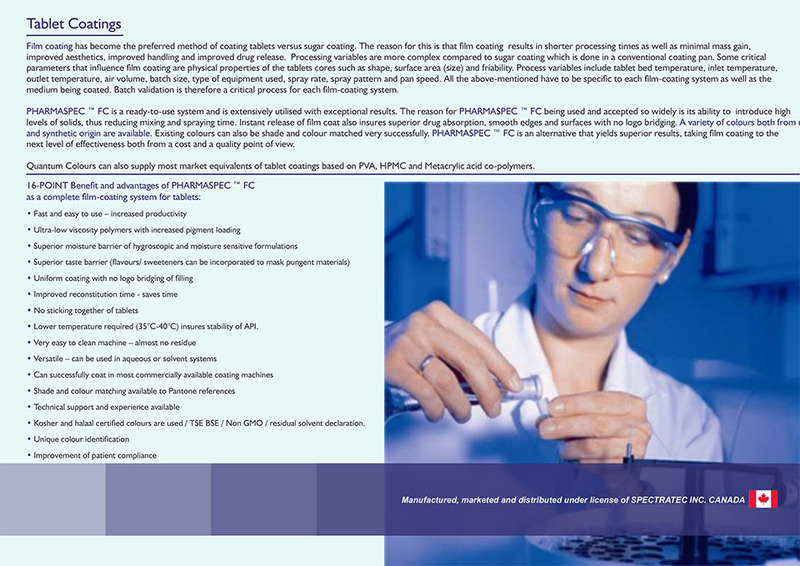 Although the coating process can usually tolerate some variations in total air volume, optimizing the total air volume is urgent for heat- or moisture-sensitive products. 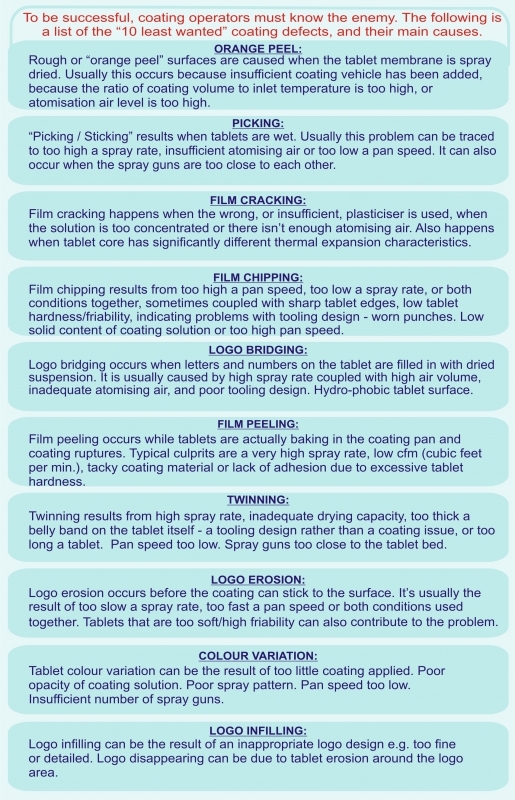 These two classifications of tablets require special handling during the aqueous coating process. Heat-sensitive products may be safely coated using a lower inlet air temperature and a corresponding slower spray rate. Moisture-sensitive products may be safely processed using a higher inlet air temperature, a larger quantity of inlet air volume and a slower spray rate. Any adhesions must be quickly and completely removed. To remove, it is best to leave the atomizing air on, stop spraying, brush residue off the gun assembly and then resume the spraying cycle. 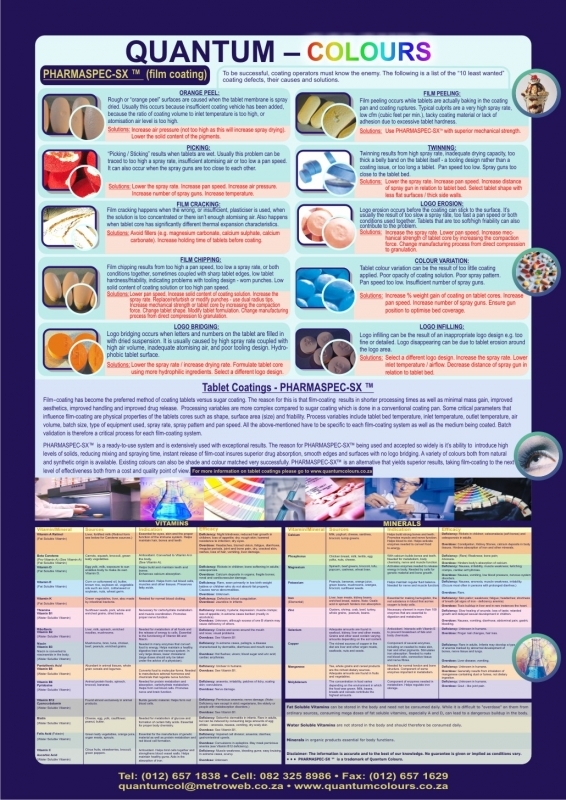 By paying close attention to operating parameters and adhering to fundamental practices, coating professionals can greatly improve the quality of their work and drug products.